Happy Sankranthi to my readers and to all my friends. Kala koora is one the delicacies made on sankranthi that is on the second day of the festival.Kala Gura is made with different seasonal vegetables.|This recipe is my sisters mother-inlaws. Take a deep pan,add oil.When hot add onions,green chillies and curry leaves. Fry until onions are pink in colour.Now add all the veggies,turmeric powder,red chilly powder and salt. Cover the pan with a lid and let it cook for 5-6 minutes. By now the veggies are soft.Add 1/2 glass of water. Let it come to boil.Now simmer and cook till the veggies are very soft and the curry is semi dry. recipe sounds new to me..
Again it's me we mix green leafy veges like totakura and lentils too.. looks yumm Saritha.. Very nice mix of all the seasonal vegetables. Great dish. 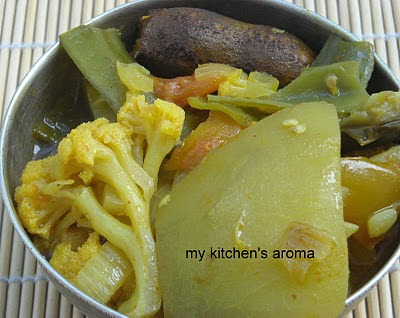 Happy Sankranti wishes..Koora looks damn tempting..
Looks lovely with lots of veggies...yumm!! wonderful mix of seasonal recipes...soul filling. You have a wonderful space and an exotic collection of recipes.Glad I stumbled onto your blog and even more glad to follow U...keep rocking.